(Phys.org) —A trio of researchers looking to test the idea of island biogeography, have found a real world example that seems to both upend the traditional tenets upon which the science is based and confirm them at the same time. In their paper published in the journal Nature, Matthew Helmus of Vrije Universiteit in the Netherlands, Luke Mahler of the University of California and Jonathan Losos of Harvard University describe their study of anoles (a type of lizard) in the Caribbean Islands and how new data shows the ways humans have impacted the means by which the tiny color changing creatures migrate. The science of island biogeography took off back in 1969, when ecologists Robert MacArthur and E. O. Wilson essentially sterilized a few very small islands and then monitored them to see how long and in which ways they would recover. Their study cemented the idea that island biodiversity is based on two major principles. The first is that the bigger an island is the more diversity it can support. The second is that the more remote an island is the less diverse it will be because other species have so much difficulty getting to it. 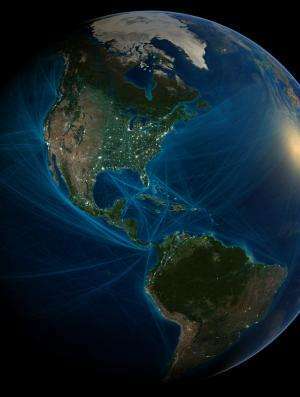 If humans weren't around, it's likely the original model would persist, but because they do, the principles have to be modified. That's because people engage in shipping which living creatures can use to migrate. 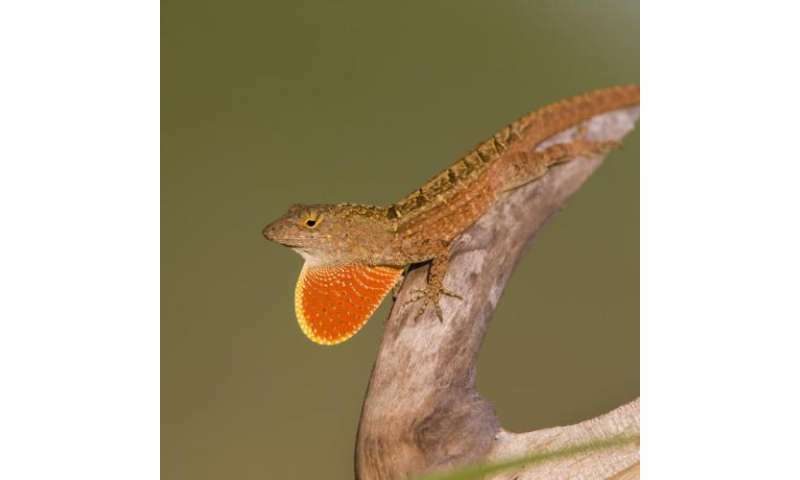 In this new study, the researchers looked at anoles as a barometer of sorts—traditional theory suggests there should be more species of them on larger islands, and more of them in general. Smaller islands on the other hand should have less, or none at all if they are too far away for migrants to reach. This new study entailed cataloguing anoles by number and species throughout the Caribbean Islands and then comparing what they found to the traditional model. Doing so showed the original model failed miserably—but it also showed why. Because distance is no longer a factor in the equation (due to so much shipping), anoles are free to migrate to wherever they wish. The researchers found that in the newly updated model, island size still dictates population density, but now economic isolation is more of a factor. As one example, they note that diversity is limited on the Cuban islands, due to the trade embargo imposed by the United States. Much smaller Trinidad, on the other hand, which has a robust trade association with other nations throughout the area, has as many of the lizards and species as the island seems capable of supporting. For centuries, biogeographers have examined the factors that produce patterns of biodiversity across regions. The study of islands has proved particularly fruitful and has led to the theory that geographic area and isolation influence species colonization, extinction and speciation such that larger islands have more species and isolated islands have fewer species (that is, positive species–area and negative species–isolation relationships). However, experimental tests of this theory have been limited, owing to the difficulty in experimental manipulation of islands at the scales at which speciation and long-distance colonization are relevant5. Here we have used the human-aided transport of exotic anole lizards among Caribbean islands as such a test at an appropriate scale. In accord with theory, as anole colonizations have increased, islands impoverished in native species have gained the most exotic species, the past influence of speciation on island biogeography has been obscured, and the species–area relationship has strengthened while the species–isolation relationship has weakened. Moreover, anole biogeography increasingly reflects anthropogenic rather than geographic processes. Unlike the island biogeography of the past that was determined by geographic area and isolation, in the Anthropocene—an epoch proposed for the present time interval—island biogeography is dominated by the economic isolation of human populations.